Dreamworks has brought us another entry in the 3D market, an amusing computer animation that would be fun for the kids but has enough for the parents. Starring the voices of Will Ferrell, Tina Fey and Brad Pitt, this comedy centers around the misfit turned bad guy who in the end turns out to be a good guy. Ah, it makes me wonder if all those bad guys out there started as misfits who just never got the love and attention they needed to not turn into full blown bad guys. Tom McGrath directed the film and for many the name will probably be unknown as it was for me. However, a little research revealed that I have seen other works of this talented gentleman such the animated Madagascar and Madagascar 2. In looking down the list of other projects he's been involved in, I see The Ren and Stimpy Show as storyboard artist and director, Cats and Dogs as storyboard artist and How the Grinch Stole Christmas as set designer. One other project caught my eye, the 1992 film Cool World starring Brad Pitt among others. This film was an attempt to mix animation and live action like Who Killed Jessica Rabbit. Good gravy, this film had a budget between $130 and $150 million. I googled several sources and couldn't confirm the definitive total but several sites repeat that figure. Whew! That's a lot of money but one site said that amount is usual for a Dreamworks animation. Of course the same site said that on top of that, you would add publicity. So, how was it altogether? I find it interesting considering what's necessary to turn a profit. After all, films are fun but the studio has to make some scratch or it will go bust. This ain't a charity, ya know! Overall the film received good reviews but in reading many of them I see a theme with which I concur now that I've just seen it. 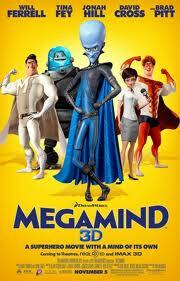 The film is good but at times I felt I was watching stuff I had seen elsewhere like in The Incredibles or Despicable Me. Oh well, if you're going to copy, copy from the best! I did laugh at the parody of Superman with Will Ferrell doing Marlon Brando doing Kal-El. Now who's going to get that? Rotten Tomatoes gave it 71%, a good rating, not great but good. This review is very late; the film has been around for a number of weeks now so if the fancy strikes you, plan to do so soon. I suspect newer films will be replacing it on the marquee shortly.